The cold weather has officially hit North Texas, and I was unprepared. Everyone said, "the winters aren't bad here" and "it doesn't get cold here"... well, coming from someone who has always lived in climates that get cold and LOVES it... it's cold. Not every day - it's strange. But the cold days are SO COLD - I'm talking a "feels like" temperature of 12 degrees one morning last week. Not exactly what I expected in Texas, but this is our first winter here, so we're still learning. Being that I didn't expect it, I was completely unprepared with winter clothes for Annabelle. When I couldn't get out to get any, I decided she needed a way to play inside. 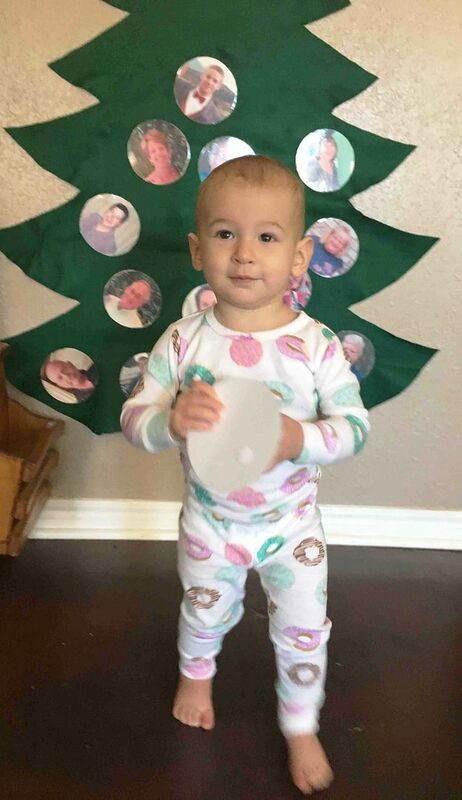 She's a busy-body of a 15 month old, so I had to get creative. 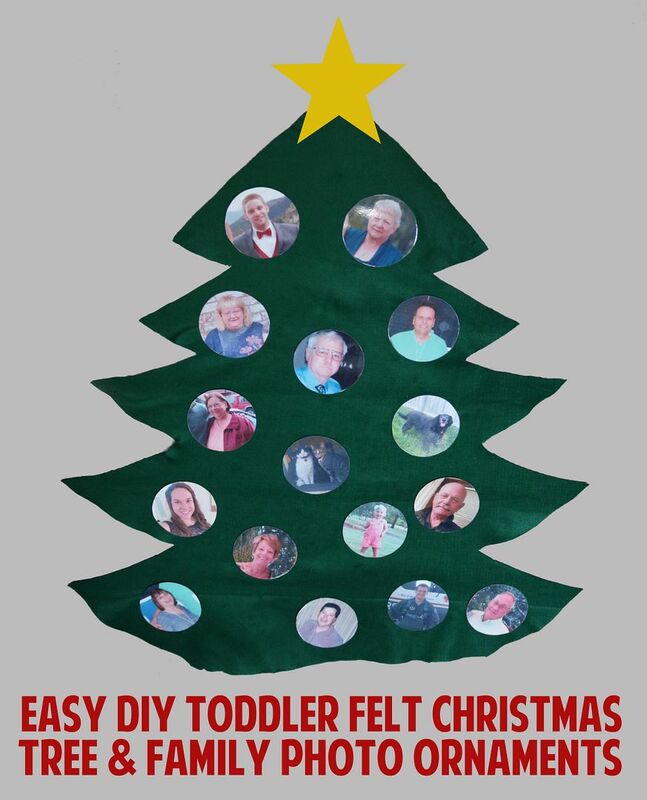 I have seen various versions of this felt Christmas tree floating around, and I decided to put my own twist on it. 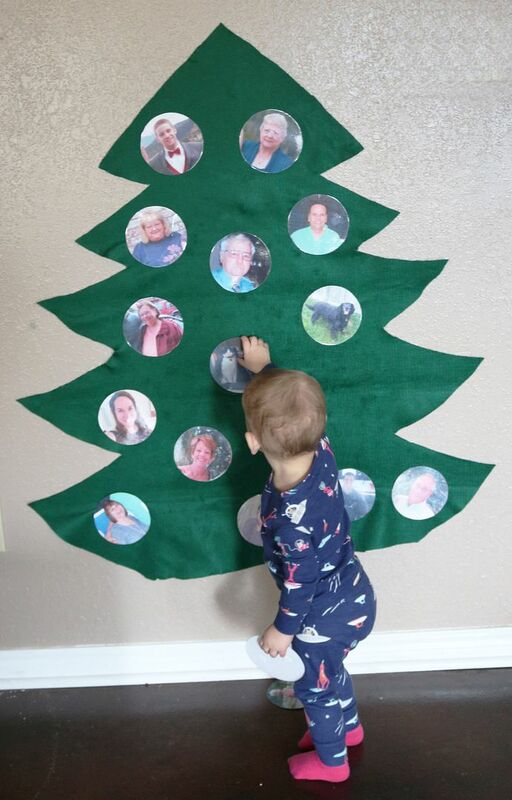 Instead of felt ornaments, I would use photos of relatives as ornaments. 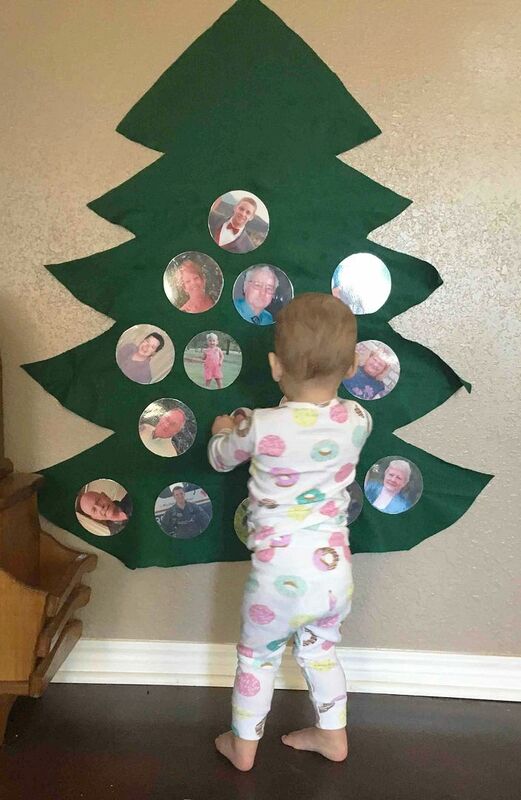 This way, Annabelle can see them every day to remember them all by since they all live so far away. I even included her three deceased grandparents because we definitely want her to know who they are. This project was kind of time consuming, but it was easy and dirt cheap... if you have the right supplies! I was able to get to Walmart for some green felt one day. I bought only one yard, and I paid less than $3 - what a steal! I gathered a photo of each relative (including Annabelle herself - she loves photos of herself!) and used a free app on my phone to make them into circles... and then I opened the circles on Microsoft Word and printed them on our home color printer on 67 lb. cardstock. 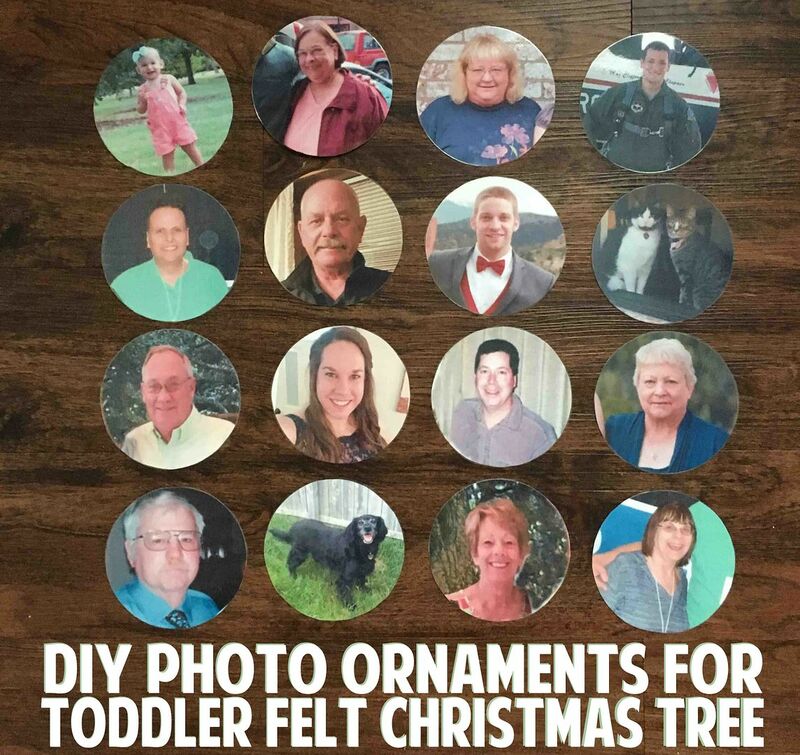 I cut out each circle, used our laminator to make each piece "toddler-prood" (aka sturdy enough she can't rip them and plastic covered so they don't get destroyed when she inevitably puts them in her mouth)! Then, I cut them again. I used velcro dots on the back (thanks, Amazon Prime - I didn't even have to leave the house again!) 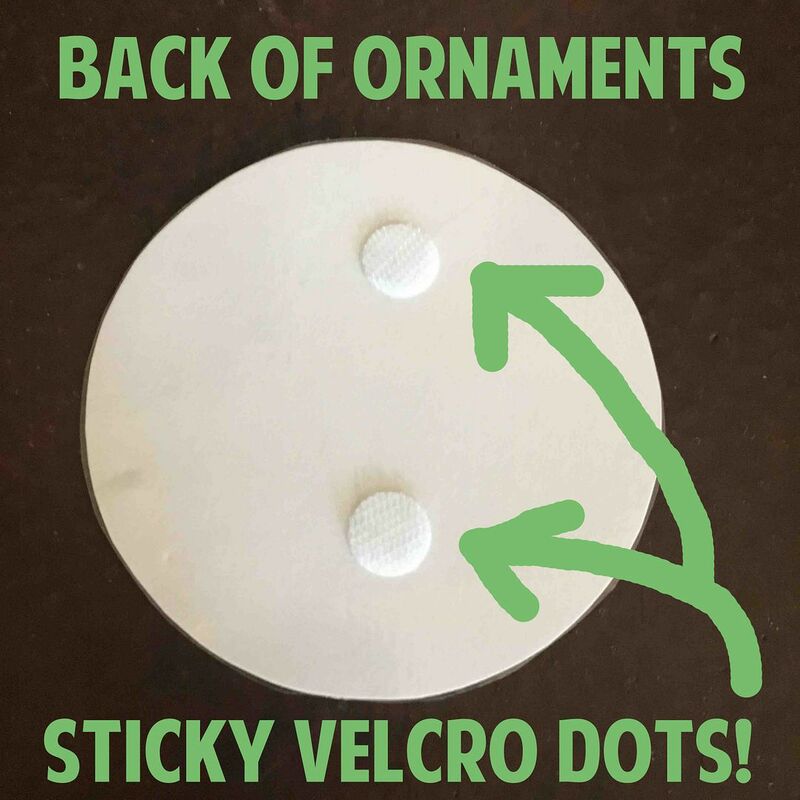 - I put two on each ornament (the dots have sticky backs, so it was very quick and easy), and they stick to and pull off of the felt Christmas tree easily. For the tree, I folded the felt in half and used a Sharpie to draw half of a tree. Then, I cut on the fold to get an even, (kind of) pretty tree. 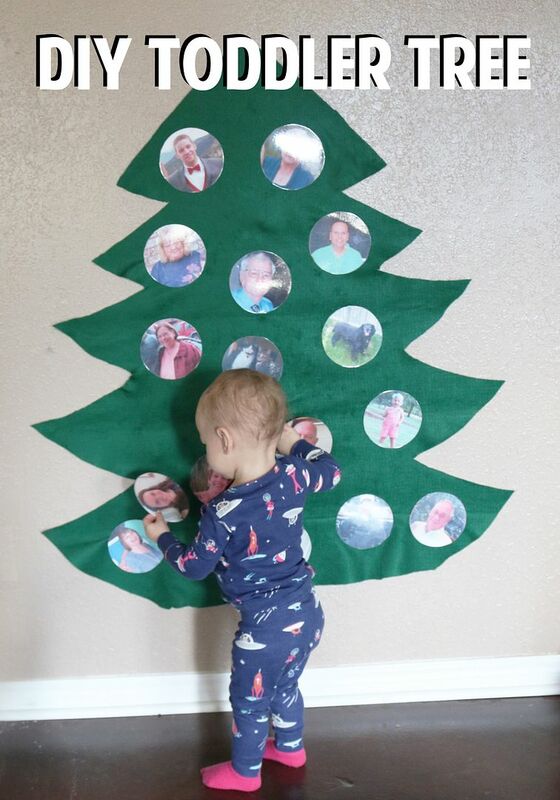 Dan used some double-sided tape to adhere the tree to our wall, and we let Annabelle loose to play with it. SHE LOVES IT. She has had this for a couple weeks now, and she plays with it every single day. 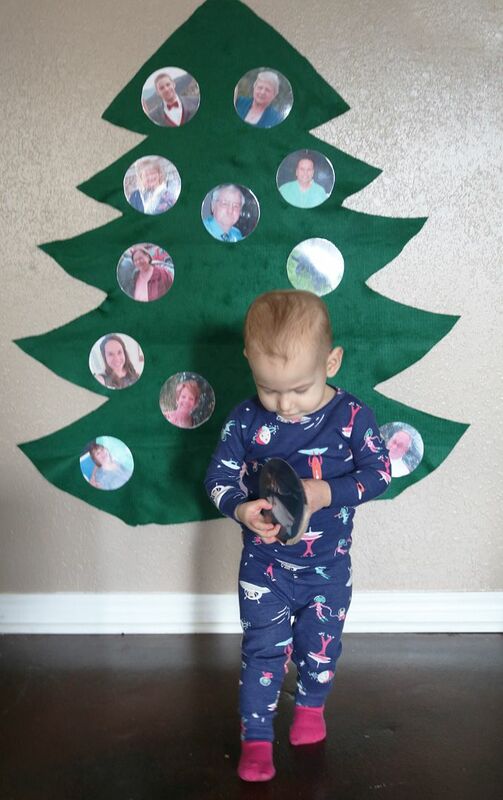 Even when she's not rearranging the ornaments, she is carrying around familiar faces. 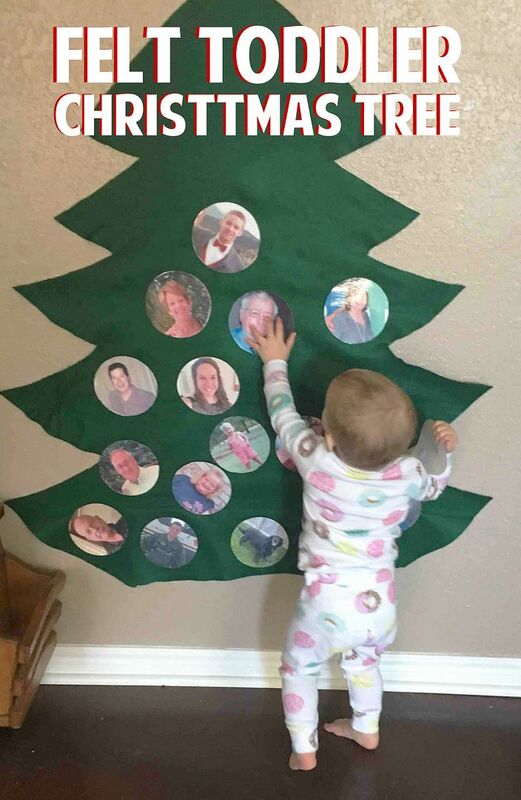 It's an easy way to repeat the names of the people over and over in hopes that she'll be able to identify them herself soon. I'm so glad we decided to make this. It keeps our spunky, high-energy toddler busy for at least a few minutes at a time. The total cost for us was less than $5 because we already had a lot of the supplies on hand. If you have to send your photos to an office supply store to be printed and laminated, that'll set you back another $10 or so... but it's still worthwhile. Oh, and did I mention we included our pets as well? Her favorite ornaments are of Smudge, Gilligan, and Stormy - of course. They're her best friends, after all. What activities do you do inside with your toddler(s) to stay busy when it's cold outside?